1. For 6.2 Create Branches, I want to only build one branch for my research area. After I created branch coverage, should I also right-click on the “Branch” coverage and select Build Polygon? When I do like this, the wms was crashed (I tested several times). 2. If I didn't build the polygon for my branch, I can continue to build the segment. However, when I finished building the segment and want to do the 8.2 "Branch Identification", the computer crashed again when I select CE-QUAL-W2 | Map Segments ↔ Branches. Could anyone help me find a reason for these two crashes? What I do is closely followed the steps in the tutorial. The bathymetry and the segments are attached below. Note, I deselect the Triangles in the display option. Many thanks and look forward for the reply! You need polygons in your branch coverage (as well as your segment coverage), so you need to get the build polygons command working before you can map segments to branches. Try cleaning all the arcs in your branch coverage (Feature Objects | Clean) before building polygons and see if that fixes your problem. Also make sure you don't have any duplicate arcs by dragging a box around your entire branch coverage and deleting any arcs that are not needed to define the boundary of the water body. If these steps don't fix the problem, I'd recommend sending your files to the Aquaveo tech support team if possible and let them have a look at the issue and see if they can figure out the problem. Many thanks for the reply! Your answer is really help for me! I found another problem. 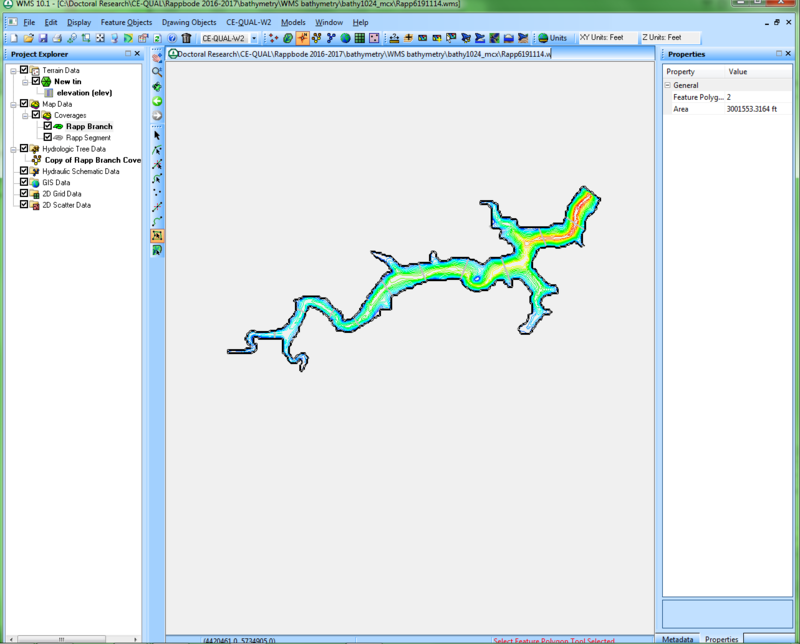 I used Arcgis﻿﻿ to generate DEM (( ASCII grid) ) for building bathymetry for W2 (right-click on the Terrain Data folder and select Open Digital Elevation file to read the grid as a DEM). 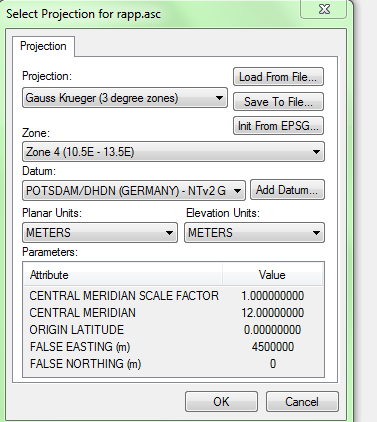 I think the Projection should be "Gauss Krueger (3 degree zones) at zone 4(10.5E -13.5E)" just like shown below. However, when I clik OK. The results show that the elevation is always higher than 1000m. Actually the elevation is from 337-423m. So I just wonder what's the reason for it. For checking, the .asc file is also attached. The problem is probably related to a conversion problem between meters and feet. It sounds like your data is being interpreted as meters and then being converted to feet inside of WMS for some reason. I'm not sure what the cause is, but it could be an issue with the projection (.prj) file associated with your ascii grid file. I'd recommend converting everything to the same XYZ units and making sure you display projection has vertical units of meters as well.